ANN ARBOR, MI – Yesterday afternoon on the Jewish holiday of Rosh Hashanah, the Jewish New Year, anti-Israeli protesters dressed up as Israeli Defense Forces (IDF) checkpoint guards were seen yelling at passers-by near a cardboard wall on the Diag. 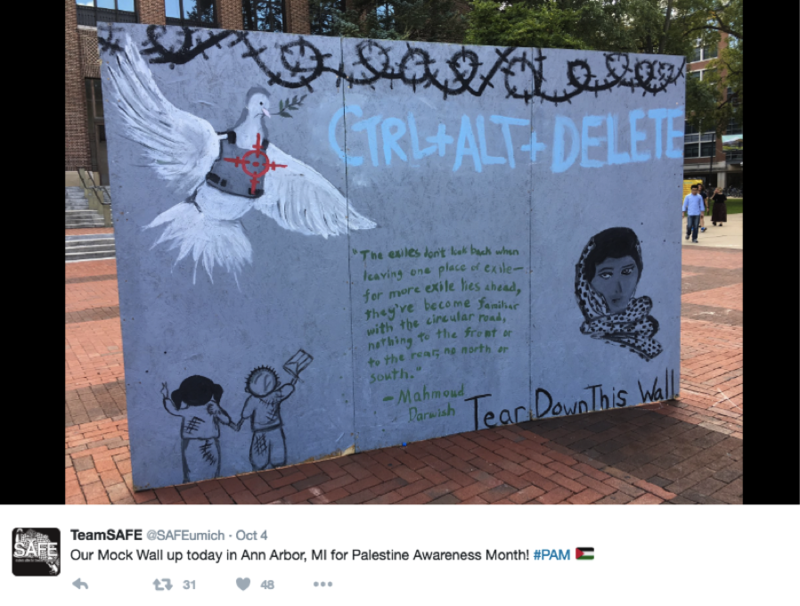 The University of Michigan campus organization Students Allied for Freedom and Equality (SAFE) erected the wall in recognition of Palestine Awareness Month. The wall metaphorically represents the security fence at the border between Israel and the West Bank. Israel constructed the fence as a result of the Palestinian suicide bombings and other terrorist attacks against Israel that resulted in the deaths of nearly 1,000 people. Slogans written on the wall expressed Palestinian disapproval of the security fence and called for its removal. Jewish and other pro-Israel students were deeply offended by the protesters and the fact that a student group was permitted to install this so-called “apartheid wall” on one of the holiest days of the year for those who practice Judaism and at one of the most visible spots on campus. Because Rosh Hashanah calls for attending service at the synagogue, many Jewish students were not on campus to express their feelings of anguish while the event occurred. Those students who remained on campus were left to cope with the demonstration without the support of many of their peers. Not only was the wall upsetting in itself, but Michigan students felt that those dressed as IDF checkpoint guards were mocking Israeli culture and arguably engaging in cultural appropriation. A group of particularly anguished students from the University authored a petition addressed to the University’s President Schlissel. They wrote, “Just last week, you sent a message to the student body emphatically stating that ‘behavior that seeks to intentionally cause pain to members of our community is reprehensible.’” They were referring to a message that the president released last week concerning racially offensive fliers that were found around campus. Schlissel will speak tomorrow at the Power Center on campus to formally introduce the Diversity, Equity, & Inclusion Strategic Plan. The University’s diversity website describes this plan as an attempt at “creating a vibrant, diverse and inclusive campus in which every individual has the opportunity to be heard, to contribute and to excel.” If Schlissel’s attention has been brought to yesterday’s events, Schlissel may discuss the protests at his address tomorrow. In order to construct the wall on the Diag, SAFE would have had to receive permission from the University, suggesting that the University initially saw no problem with this wall intending to honor Palestine Awareness Month. “Anti-zionism” is just racist political antisemitism. Because they are focused on their religion driven anti-Semitism… which American traditional media ignores because they are also anti-Semitic. The left hate Israel because Israel is a democracy where there is actual freedom. I have always believed the left love Islam because they wish they had the raw power Islam has over it’s citizens and your only freedom is to decide to convert, pay the tax for not converting, or die. In the liberal hierarchy of victimhood being Muslim trumps all other protected classes. Great example is how a Muslim murders 49 gays in Orlando and liberals contort to distance Islam’s persecution of gays from Islam. The American press says nothing about honor killing of women, modern day slavery/human trafficking and genocide in the Middle East (all perpetrated by Muslims), or the fact that Sharia gives women fewer rights than cattle.